He has dabbled in almost all genres of films -- be it action, comedy or romance. But actor Ajay Devgn feels he still has a lot to explore in the world of cinema. "When you get new scripts, you read them and then realise that 'ok I have not done something like this, I would definitely do it'. 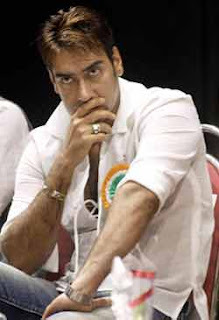 So for me as an actor, there's lot to be explored yet," Ajay told IANS here Tuesday. "Moreover, when you work in new films, work with new directors, you learn something every day," he added. The actor was present with the entire cast of his new film "Golmaal 3" at PVR Cinemas in Ambience Mall, Gurgaon. He was accompanied by actors Kareena Kapoor, Shreyas Talpade, Tusshar Kapoor, Arshad Warsi, Kunal Khemu and filmmaker Rohit Shetty. Ajay is known to be a big time prankster on the sets. Asked what kind of pranks he played this time on his co-stars, Ajay replied: "I haven't done anything this time because everybody knew what can happen." But his co-star Kareena was quick to respond: "Ajay is lying!"